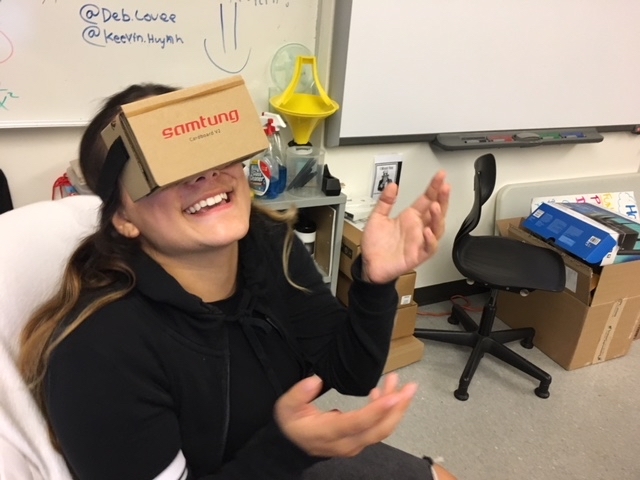 My class was visited by Google representatives a couple years ago and I took the students on Google Expedition tours to Mars, Yosemite, and other teachers in my media academy used the tours for their classes. Last year, I didn’t do anything with VR because the kit is expensive if you have to purchase the whole kit that Google brought to my school. A classroom set costs $9499. So this year I decided to look at all the components in the kid and purchase what I could on the cheap. I started with the viewers. The viewer (without the phone) is actually the cheapest part of the whole thing. The viewers in the kit are plastic and probably have the ability to move the lenses to fit your pupil distance. This is probably a nice thing to have because headaches, dizziness, and strained eyes make VR pretty difficult for most. I just went with the cheapest “Cardboard” kits I could find. They were $9 each. I then looked at the router sold in the Expedition Kit and remembered when the Google Guys came they had a nice one with all kinds of antennae coming off it. I also remember some connection problems and students needing to switch to another channel to get onto the tours. So I found a pretty nice wireless router. The Linksys AC5400 Tri Band Wireless Router seemed pretty good. I’m sure you can get by with something less expensive, but I had a plan to get all this for free. Next, I needed an iPad. If you have one, you’re set. Also, you can use your own phone, Android or iPhone, to be the tour guide and tour your students around. So this one can be free for you. Like I said before, I had a plan so I went for a new iPad with WiFi only at $334. My plan to get everything for free? I created a Donors Choose project to fund it all. There was a matching offer for Maker projects where all donations would be doubled, so I made sure my project focused on the DIY aspect of creating this kit along with the kids assembling the Cardboard viewers and using their own devices so I would qualify for the matching. I got my project funded in a couple weeks. So the cost of my project? Zero! Teachers learn to live in such funding-poor environments in their classrooms and everyone knows it. I have found that friends, parents, and people in the community are willing to donate a lot if they just know where the funds are going. You can create your project, list what you need, and the stuff comes directly to you. I don’t know why more teachers don’t use Donors Choose. My next post will outline how I connected it all up and got my Expeditions running.